In this quick tutorial you'll learn how to draw a Brown Thrasher in 6 easy steps - great for kids and novice artists. At the bottom you can read some interesting facts about the Brown Thrasher. Step 1: Let us start by drawing the Brown Thrasher’s head and beak. 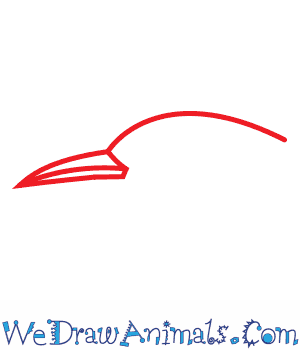 Draw a curved line for the head and add a curved triangle in front of it for the beak. Step 2: Draw a small circle and a ring around it for the eye. For the nostril, add a tiny circle at the part where the beak meets the head. 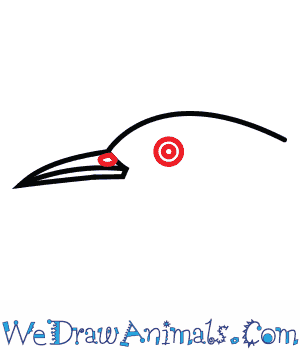 Step 3: For the top of the bird's body, draw a gently curved line from the head as shown. 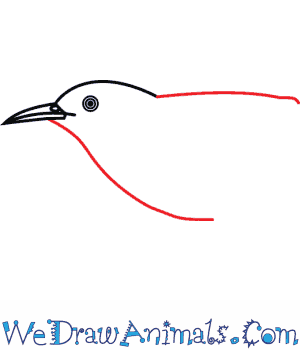 For the lower part of the body, draw a curved line from the beak. 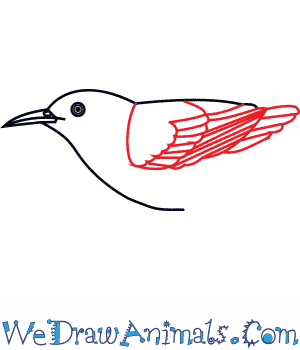 Step 4: Draw curved lines to outline the wings and draw the details of the feathers using slanting lines and curves as shown in the image. 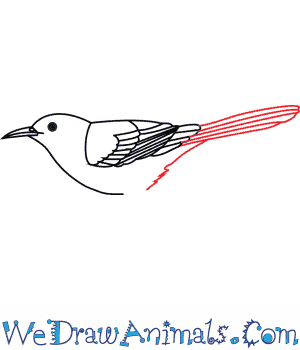 Step 5: Use five slanting lines to draw the tail of the bird. 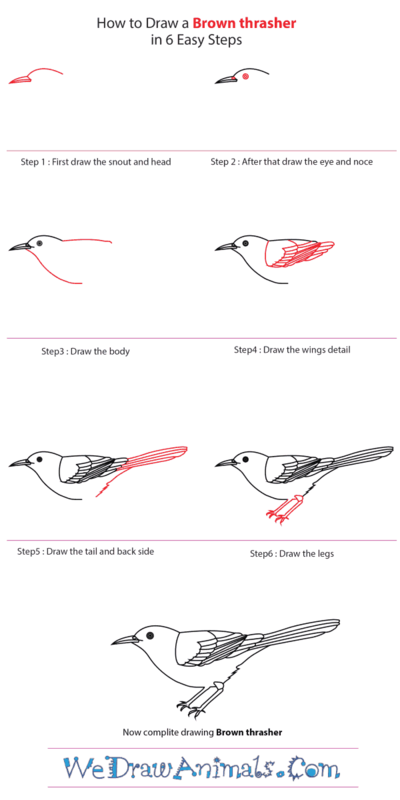 Draw a slightly jagged line below the tail to complete the back part of the bird’s body. Leave a small blank space for the legs. 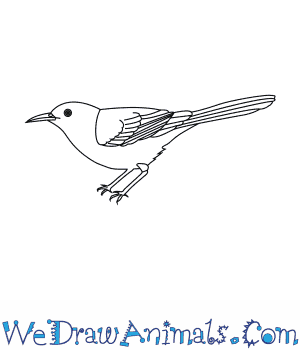 Step 6: Now, let’s draw the legs of the Brown Thrasher. 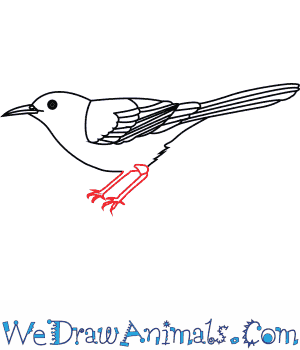 Start from the body of the bird and draw slanting lines for each leg. Make the second leg a little bigger than the first one as shown in the image. At the end of each leg, draw four claws using small curved lines. After you finish your drawing, you can color it. The Brown Thrasher is a perching bird that lives in wooded areas over most of the United States. They are large birds with brown feathers and white underparts. Their chests are spotted with brown spots. The eat bugs, fruit, and nuts. They like low places to put their nests like bushes or even just on the ground. Brown Thrashers measure 25 to 30 centimeters long and their wing span is 29 to 33 centimeters. There are 2 subspecies of Brown Thrasher. Brown Thrashers have over 1,100 songs they sing and they even mimic other birds. Both males and females help build their nest. It is part of their mating process. In the state of Illinois in the United States the Brown Thrasher is one of the most common birds to die from being struck by cars. Brown Thrashers are the state bird of Georgia in the United States. Lesson Plan Note: Find a recording of bird songs. Then test your class to see if they can guess which bird goes with which song. Some can be easy like owls and some can be hard like mockingbirds or other mimicking birds.